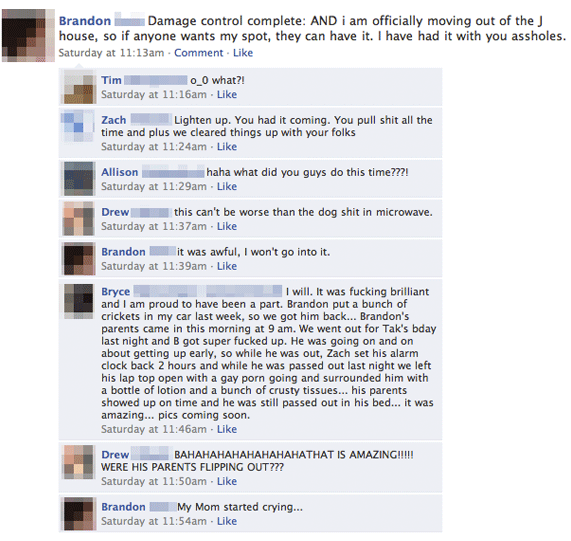 Brandon put a bunch of crickets in my car last week, so we got him back… Brandon’s parents came In this morning at 9 am. We went out for Tak’s bday last night and B got super fucked up. He was going on and on about getting up early, so while he was out, Zach set his alarm clock back 2 hours and while he was passed out last night we left his lap top open with a gay pom going and surrounded him with a bottle of lotion and a bunch of crusty tissues… his parents showed up on time and he was still passed out… In his bed… It was amazing… pics coming soon.